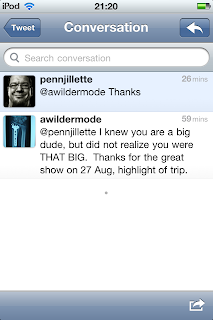 We may not be best friends, but Penn Jillette is a great guy. I have read his books...yeah plural, books...and in writing, he seems like great guy. I follow him on twitter, read his tweets. He also responds to people on twitter as if he is best friends with everyone. So, yeah...we are best friends. I sent this to P&T just hours before the show, and he wrote back...again. I had a chance to go to Las Vegas this past weekend. Normally, I do not care for the amount of douchebagery that breeds in Vegas. 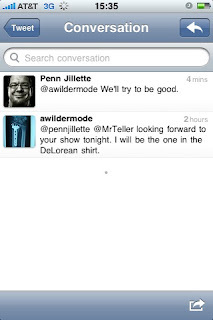 But since I was going to be there, I wanted to see Penn & Teller. I have been to Las Vegas twice before and did not get a chance to see them. I even stayed at the Rio for New Year's once and did not go. This time for sure it was a must do. The show was great. After the show, Penn & Teller run off stage and head back to the 'lobby' area to greet the audience, sign stuff, and take photos. It just shows what great people they are to meet with 1400+ fans after each show. Teller about to sign Penn's book. See, we are best friends. If you are ever in Las Vegas, I highly recommend the Penn & Teller show at the Rio All-Suite Hotel and Casino in Las Vegas. 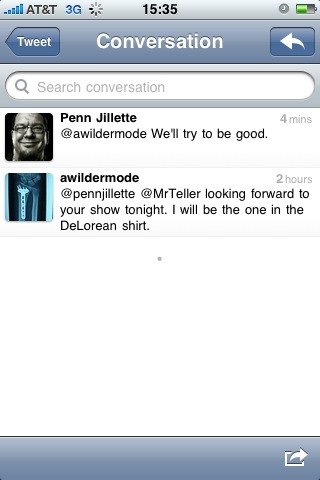 Thanks again to Penn & Teller for a great show that made the trip well worth it. Hope to see their show again. * Yes, I realize that Penn is most likely just responding to random tweets and has no idea who I am.